If you GOOGLE “2017 Wedding Trends” pages of information will appear. I know this because that’s exactly what I did recently while researching a recent presentation to a group of event professionals. Herewith are my findings listed in alphabetical order with photos below the text. Which trends do you like? Which ones do you not like? Let us know! Favors & Gifts – we have never been a fan of tchotchkes. You don’t want to get them so why give them. We are fans of donations to a charity that’s important to the bride and groom and anything edible. Some couples are going so far as to indicate a donation instead of a wedding gift, “We have enough, please contribute to XYZ charity”. 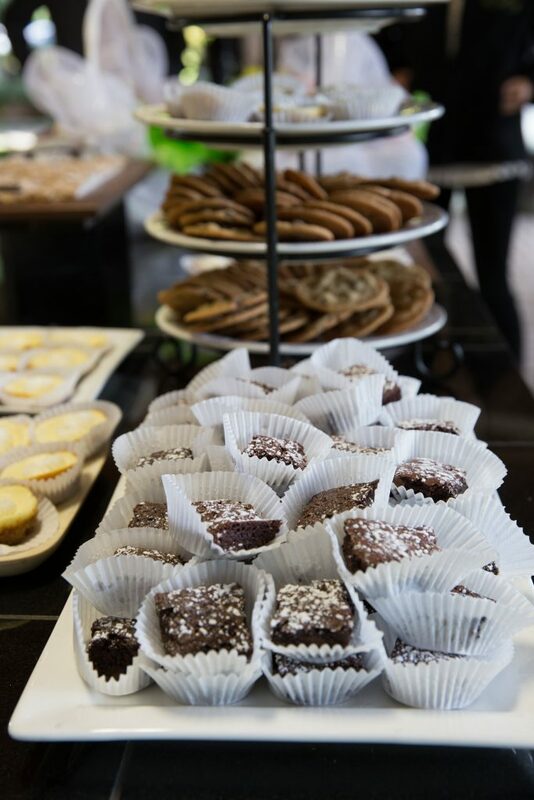 Think buffets for candy or baked goods. Set up a bakery with staff behind the table or counter filling small boxes lined with waxed paper. Use twine or a cute custom label to close the box. One couple had bags of cookies made in the shapes of all the states they’ve been in with coffee to go as guests departed. Swag lounge – instead of hotel gift bags set up a room with light refreshments and all the swag you would have put in the bags and let your guests come and take what they’d like. Great opportunity for all the hotel guests to meet and greet as well. Have a pile of custom printed paper or fabric bags to hold all their goodies. Rustic and Boho are OUT – Mountain Chic is IN! 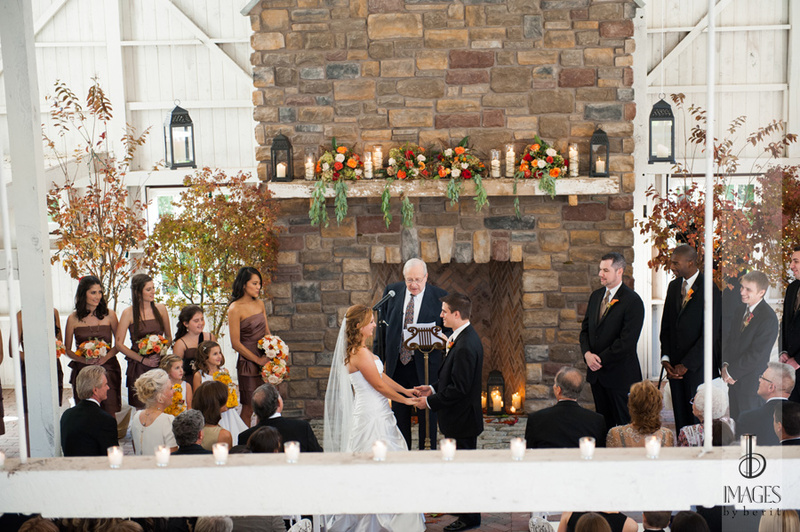 Use elements that fit your style and the style of the venue. Not every Rustic – sorry, Mountain Chic – theme needs burlap, mason jars, and tree planks. 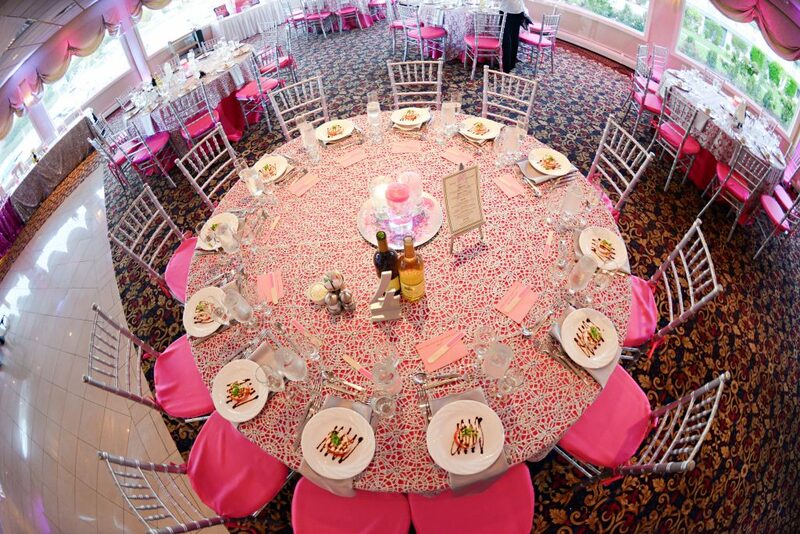 Heterogeneous vs. Homogeneous table decor – same color palette, different arrangements on each table. Signs – tell everyone what’s going on with a beautiful sign. Instead of chalkboard think wood, slate, plexi-glass, or faux marble. Food & Beverage – you can still have pigs in a blanket. Work with your caterer on a twist such as bratwurst or sausage instead of hot dogs! Food Choices – local foods, ethnic foods, family recipes, meal special to the couple (what they ate on their first date). 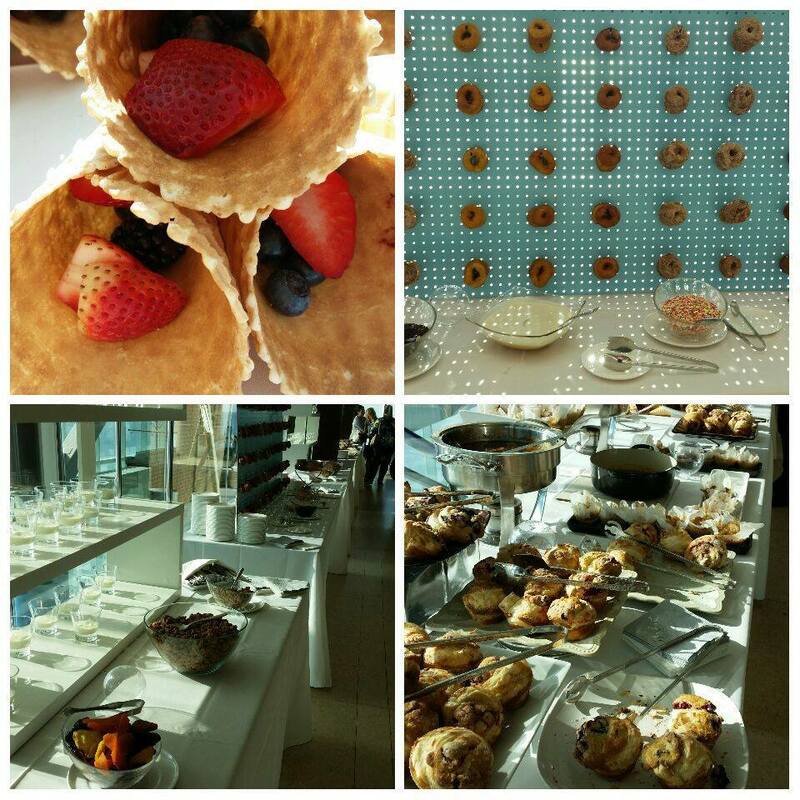 If your caterer isn’t up for any of these find another caterer. 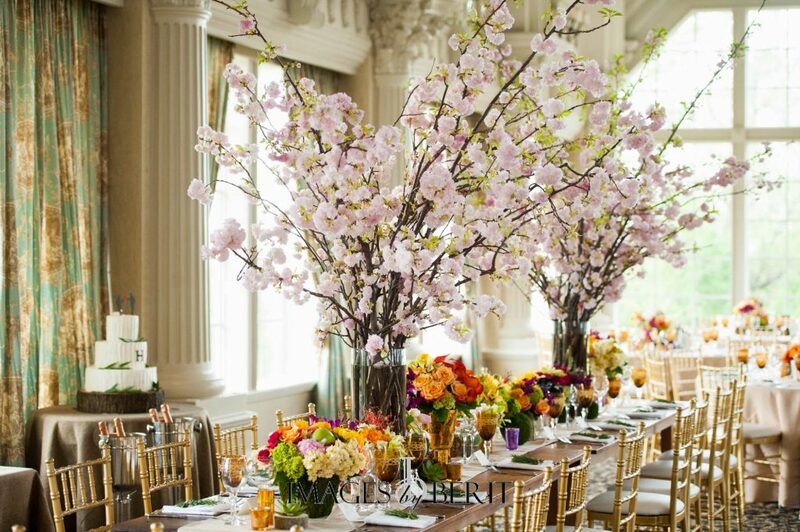 Morgan and Craig’s fall themed wedding at The Ashford Estate utilized trees for the ceremony that were then moved to the ballroom to frame their sweetheart table. At the end of the night Craig’s parents took the trees home to plant! Photo courtesy of Images by Berit. Images – your photos and video will last beyond your lifetime. A family history for all to see. These images are the only lasting impression that you’ll have of a day that took a long time to plan and will go by in an instant. Don’t scrimp on your photographer or videographer. There are plenty of other places to save money. Make sure your photographer “gets” you. Have an engagement session to make sure you’re compatible. 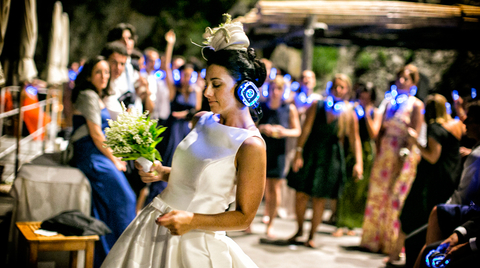 Your wedding day is a once in a lifetime opportunity. If she/he makes a suggestion for a photo that’s outside your comfort zone GO FOR IT. The results might be amazing…. Photo courtesy of Jeff Tisman Photography. Lighting – a MUST for any event. We are huge fans! Lighting brings life to a windowless ballroom. New for 2017? Image mapping, single color wall wash, carnival lights with orbs or Edison filament bulbs. Use your imagination. Can’t even begin to tell you what the lighting did for Kristen and Evans’ wedding. 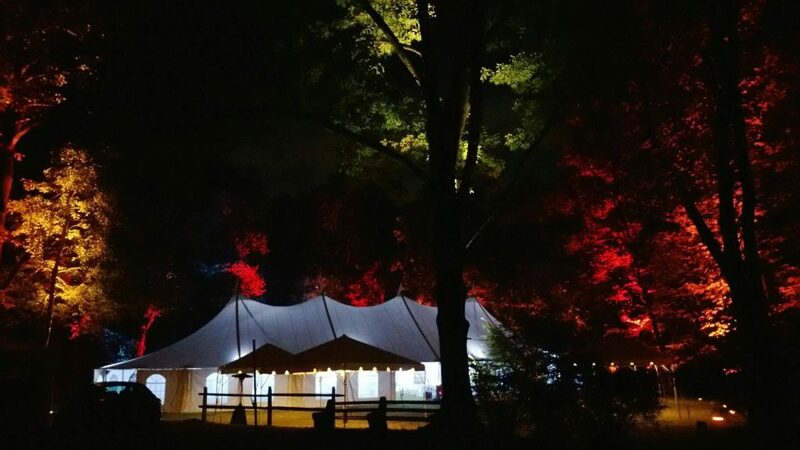 The trees surrounding the tent were lit with variable LED lights that changed color in sync; the tent had specialty pattern lighting including custom gobo; paths were lit so guests could maneuver safely around the field once it got dark. Lighting design and installation by Josh Charles of SCE Event Group. Photo courtesy of Andrew Graham Todes Photography, LLC. Metallics – mix and match colors and textures. Could be as simple as utensils at each place setting or as elaborate as linens used sparingly. Look for metallic bridesmaids’ dresses; foil stamping on stationery; edible glitter added to the wedding cake. Venues – who says everyone has to sit at a round table all night long? Encourage mingling and dancing by putting groupings of lounge furniture around the dance floor. If all you can fit is tables then make them different sizes and shapes. Chivari and padded folding chairs come in all different colors. Mix it up a little. 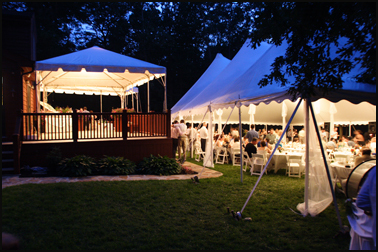 Think outside the ballroom box – big open field, tents, unique spaces with killer views. Pipe and drape along with professional lighting can change an ugly duckling into a beautiful swan. Surprises – This is my favorite category. 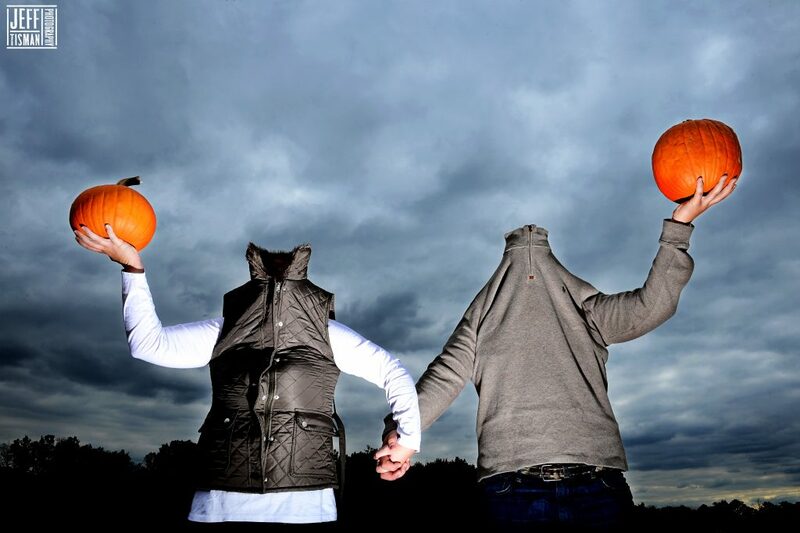 We’re always looking for new ways to surprise our clients with an unexpected detail. Confetti cannons after your first kiss at the ceremony; a marching band to lead your guests to the next phase of your event; eat dinner first then party without interruption serving cocktail hour type food at the reception (can’t drink without something to eat!). Save the wedding cake and coffee service for the end of the party to get everyone to sober up a bit. 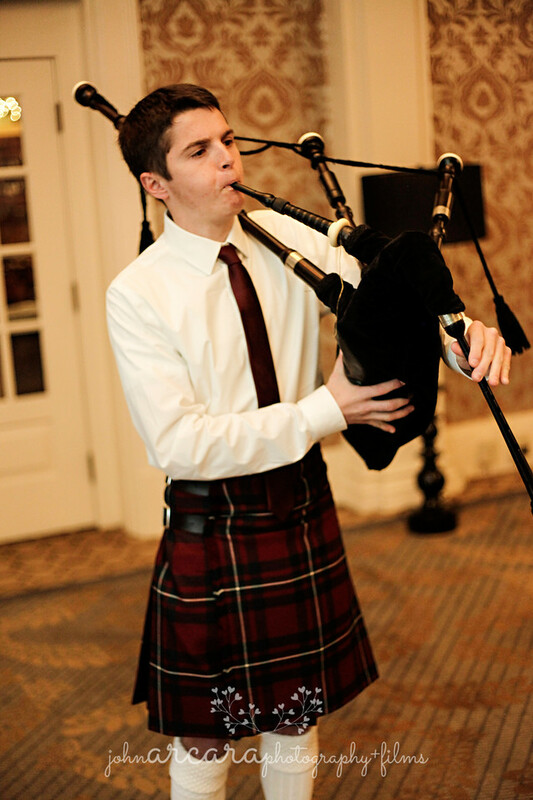 Barb and Frank’s guests were led from the ceremony to the reception by a bagpiper. The son of Barb’s best friend he brought his kilt and bagpipes to The Stockton Seaview from Chicago. Photo courtesy of John Arcara Photography. Trends to avoid in 2017: According to the bridal experts to at Vogue Magazine as published on December 27, 2016. These are the experts – not saying I agree with any of them……..Naming Signature Drinks; Family-Style Dinners; Floral Runners; Large Bridal Parties; Giant Bridal Bouquets; All white decor; Converse Sneakers or Cowboy Boots on either the bride or the groom; Flower Crowns; Food Trucks; Floating orchids.